It is such an honor to have the Spirit Books featured in Letter Arts Review which I have always admired for the quality of the work featured and the elegant design. Test Patterns. Some became books, others did not. Q: To follow up on that question, I notice that the Spirit Books strike me, not as morbid, but as evocative of death, decay, and loss. They remind me in some ways of Victorian funerary artworks—like a lock of hair carefully labelled and kept in a small box. I find myself wanting to display them under a glass bell-jar, in the Victorian manner. Some plant materials seem very much alive—the chestnut you mention retains its luster, even once it has fallen from the tree. Its warm orange-brown skin is evocative of life. And of course, as a seed, it speaks of the possibility of renewal and new birth. But most of the materials you choose are spent, desiccated—seed pods open, their function accomplished; dried thorns that will never spring back to green. I wonder how you respond to this reaction to the works. A: As I said in the previous question, the practicality of making something from untreated materials means that I cannot control their aging. And that is part of the appeal of the process for me. The Spirit Books are very much about letting go. I make no sketches, I have no vision of how the finished product will look. I want to be led by the materials. I think this has deepened as I am age. 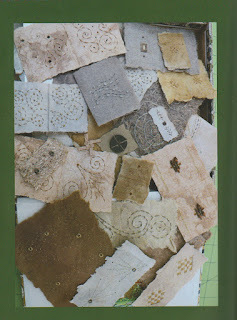 I made the first Spirit Book when I was 41. At 67, I am ever more interested in connecting with a deeper world outside myself. I am attuned to the Celtic seasons and the Wheel of the Year because they acknowledge that the earth moves in a cycle of light and dark, that the exuberance of the longest day at the summer solstice carries with it the diminishing light of the days to come. I have always been moved by an understanding that every moment is individual and unrepeatable. While I’ve never been nostalgic to go back in time, I find the fact that a particular moment is a unique event to be worthy of both joy and sorrow, awe and tears. I realize more and more how deeply affected I was by the sudden and unexpected death of my mother at age 57 when I was pregnant with my first child. I want the Spirit Books acknowledge the passage of time while stepping outside of time. 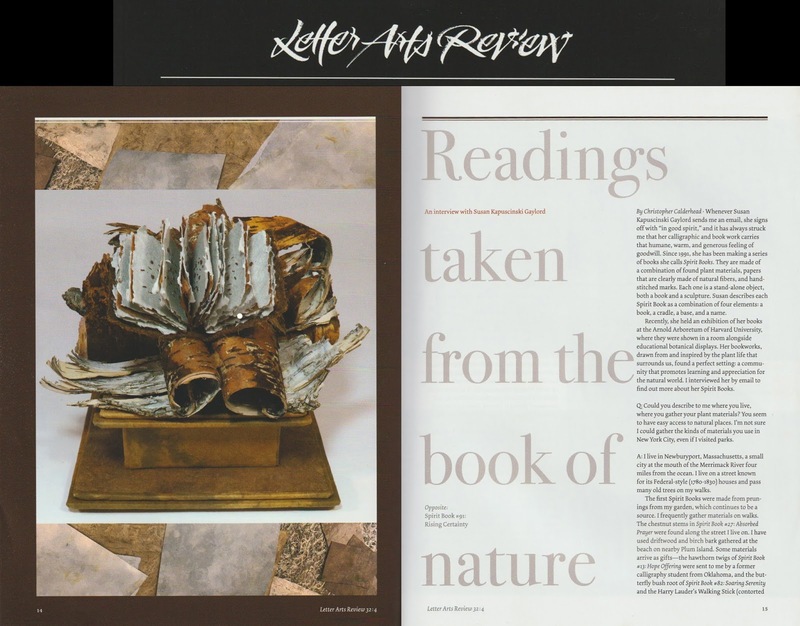 If you are not a subscriber to Letter Arts Review, individual copies may be purchased from John Neal Bookseller.